While Inoue Momota's comic adaptation of The Extreme Speed Genosect and the Awakening of Myuutwo is very close to the source material, there are a few differences between the two. The purpose of this page is to highlight those differences. 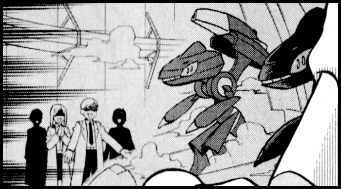 The biggest change made in the comic has to do with what we now know as Mega Myuutwo. 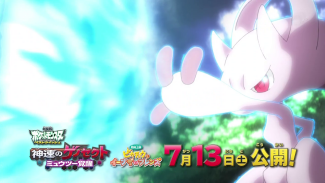 In both The Extreme Speed Genosect and the Awakening of Myuutwo and the TV special that served to promote the movie, Myuutwo - The Prologue to Its Awakening - Myuutwo is able to transform into Mega Myuutwo right away. We don't get any explanation, any backstory, any glimpse of the first time it figured out it was able to do this, nothing. 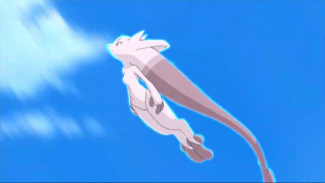 The pokemon is able to transform into Mega Myuutwo whenever it wants, just because. In the manga adaptation, however, Myuutwo doesn't seem to be able to transform until about halfway through the story. During its initial battle against the Red Genosect, Myuutwo gets thrown into the side of a building and is presumably knocked out. The Red Genosect then goes back to Pokemon Hills, leaving Myuutwo there by itself. 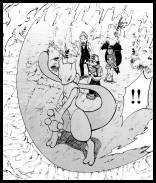 We then get this page-long sequence of Myuutwo "sensing" the fighting going on back in Pokemon Hills before it regains consciousness and rejoins the battle. Once it returns, Myuutwo pleads with the Red Genosect to stop the fighting. It refuses and so Myuutwo, with the voices of the other Genosect echoing in its ears, decides that there's only one thing left to do. Myuutwo closes its eyes and begins to transform into Mega Myuutwo for the first time. When it finally completes its metamorphosis, everyone looks on in shock. I like the manga adaptation better for a number of reasons. While I'm sure part of it has to do with me reading the manga adaptation before seeing the movie and therefore having that be my first exposure to the story, I also like the manga adaptation better because it actually tries to explain why Myuutwo is even able to transform in the first place. 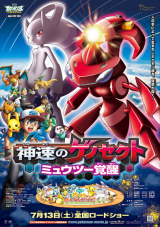 It makes the transformation a major event, on par with Keldeo's transformation in the previous movie, while the animated version treats it as something we're already supposed to be familiar with. Because of this change, any scene that featured Mega Myuutwo before the halfway point in the movie was altered in the manga so that Myuutwo is in its regular form instead. 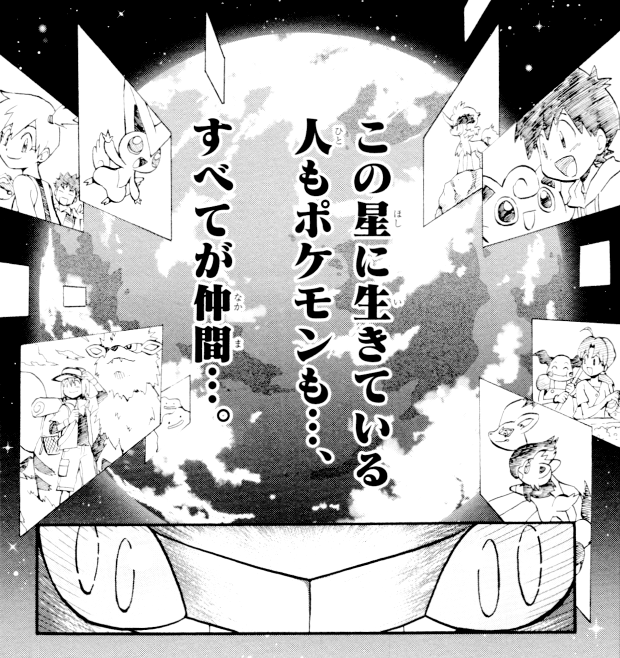 It's also worth mentioning that even though the manga tries to make Myuutwo's transformation more of an event than the movie, neither the movie nor the manga show Myuutwo with a Mega Stone or any other type of item that would enable it to change. It transforms because it wills itself to, not because it's holding anything. The scientists who are around when Myuutwo is born are different depending on which version of the story you're looking at. Here are the scientists who created Myuutwo, for example. 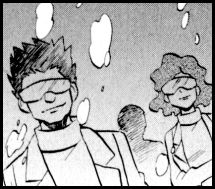 Likewise, the manga replaces the Plasma-Dan grunts in Genosect's flashbacks with generic scientists in lab coats. 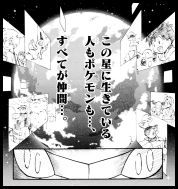 The Plasma-Dan logo on the door in the movie doesn't make an appearance in the manga, either. 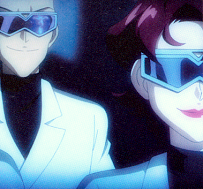 Perhaps Ms. Inoue was not given the character designs for the Myuutwo scientists and had to therefore come up with her own? The Genosect scientists, on the other hand, should have been easy because the fact that the movie was going to follow the games and have Genosect be created by the Plasma-Dan was public knowledge way ahead of time. Why not draw Plasma-Dan grunts instead of these generic scientists? This does not happen in any way, shape, or form in the movie itself, and there's no way Ms. Inoue could have thought that it did. Maybe she was just feeling nostalgic and wanted to try drawing some of the older characters?